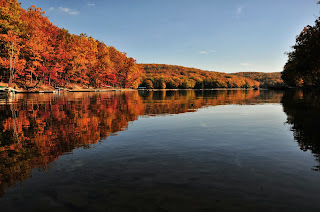 If you are joining us here at Deep Creek Lake sometime in the next week or two, I would suggest that you bring a sweater as the temperatures at night are beginning to cool down. Perfect bonfire weather if you ask me! There are some exciting events happening around the lake in the next month so now is the perfect time to plan a fall retreat. The weekend of October 3rd is the annual Springs Folk Festival held in Springs, Pa, which is just a mere 30 minutes from Deep Creek Lake. This festival is a celebration of the arts, skills, and labors of their forefathers. 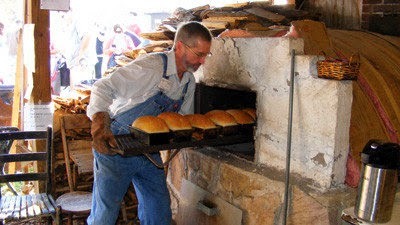 Guests will be able to wander around the grounds and observe the women weaving and baking bread while the men replicate the days of threshing grain and hewing logs. Continuing performances of blue grass and gospel music can also be enjoyed throughout the weekend. Visitors will also have the chance to view the wares of over 140 artisans who will be showcasing paintings, baskets, wood carved furniture, quilts and more. Find you inner-kid again and enjoy the fresh made lollipops, kettle corn, and homemade ice cream. Authentic Dutch style food can also be tasted with sausage meals, pancakes, bean soup and fresh baked bread. If you are looking for something unique but fun and family-oriented, make the short drive to check it out! The beauty of Deep Creek in the fall! Speaking of festivals, it’s hard to believe but our Autumn Glory Festival is just around the corner coming up from October 10-13. Aside from the big Autumn Glory Parade, there is also the Fireman’s Parade, the Band & Color Guard competition, car shows and craft and antiques shows just to name a few. It’s one of the best times to visit Garrett County. If that doesn’t convince you, then simply come and enjoy the breathtaking fall foliage that takes over our area at that time of year! Call us at Taylor-Made Deep Creek Vacations and let us help you find the perfect home for your Deep Creek stay (1-866-351-1119 or online www.deepcreekvacations.com). Can’t make it that weekend? Let us know your dates and not only will we help you find the perfect home but we will give you lots of ideas of activities to do while you are visiting us! The air is crisp, the sun is shining and we can’t wait to see you at the lake! Previous Previous post: So Long to Summer! Next Next post: A whitewater rafting excursion!